When was the last time you were able to participate in a teacher professional development plan or program that made an immediate impact in your classroom? If you’re like most of us educators, it’s been a while. A long while. Somehow, even though we’ve made huge strides in providing differentiated, relevant and exciting instruction for students, teachers still get the raw end of the deal. We sit in staff meetings with boring powerpoint presentations, receive no differentiation, and leave feeling a lot more tired and a lot less invigorated. Here’s the good news though: teacher professional development doesn’t have to be boring or inconvenient! There is a multitude of better ways available to all educators – it’s just a matter of planning and some strategic advocacy. As teachers, we all know that continuing professional development program is important to stay current and earn our required hours. And if you’re interested in arts integration and STEAM, we have some fantastic opportunities for you! 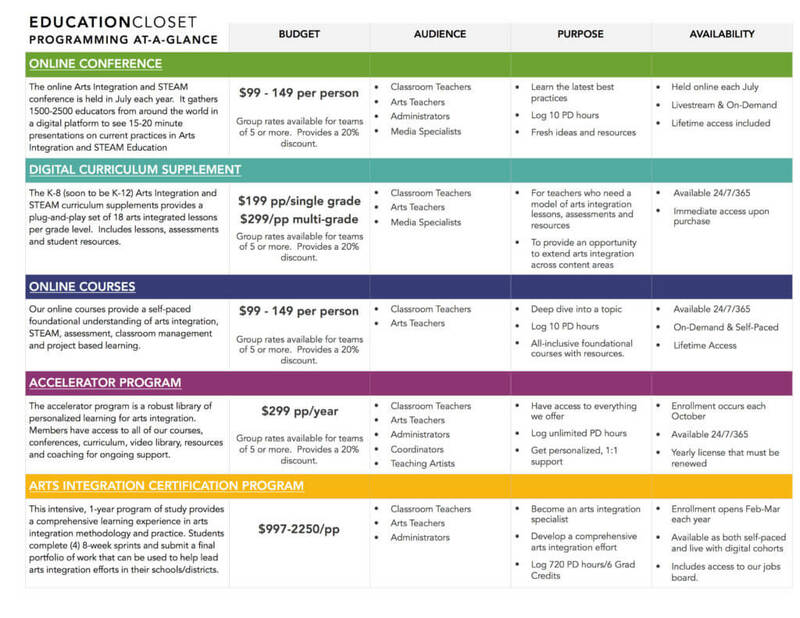 Here’s a professional development plan for teachers that shows you how to earn your PD hours on any budget. When determining what teacher professional development plan or options would be best for you, consider what you’d most like to focus on for your own teacher growth. Are you interested in Arts Integration? STEAM? PBL? Assessment? Select your focus first to ensure that whatever you choose, it’s the most meaningful opportunity for you. One of the ways that PD is changing is through a growing online learning experience. But not everyone learns best online. Think about whether or not you need to be physically present to best learn the material. If so, check out your local colleges or even state/national conferences and summer courses. This traditional professional development plan is still a good fit for many teachers who like to learn face-to-face. If, however, you enjoy the convenience of learning online, the world is really your oyster! Our specialty is in online learning and we offer several different ways you can join in. If you like being able to chat with others and bounce ideas around in a fast-paced environment, then our online conference is going the be the best option for you. If you’re more of a self-paced learner who likes to take it a bit slower and go through things on your own, our online classes will best meet your needs. These provide you with lifetime access to all of the course components (videos, handouts, and resources) and you can do as little or as much as you’d like. So you can learn poolside or while the kids are at summer camp. It’s up to you! Do you need PD hours or graduate credits? Both? Knowing what you need will go a long way in helping you streamline your teacher professional development plan and growth opportunities. If you need graduate credits, you’ll want to seek out a college or organization that offers courses from an accredited institution (we don’t). If you just need PD hours or CPUs, then you can save some money and participate in a wide variety of online and in-person opportunities. For example, all of our courses and conferences are worth 10 PD hours. This means that if you took all of our online courses and our conference this summer, you’d be able to get 50 PD hours from the comfort of home. And most likely for the same price (or less!) than just 1 graduate level course. You’ll also want to check with your state/district as to their provider requirements. Some states (like PA, TX and NY) require all PD – no matter for graduate credit or PD hours – to be from an approved PD provider. Luckily, we are an approved provider in most states, so our hours will count for you. Just be sure to check as not all PD providers are approved. Once you’ve determined what you want to learn, how you want to learn it and have a good understanding of your state/district’s requirements, then it’s time to make the pitch to your administrator. If you walk in armed with all of this information, your administrator will see you as the empowered and committed professional that you are. Be concise and share why this professional development plan for teachers is the best fit for you. Most schools/districts need to spend their PD money before June 30th of each year and often, they have leftover funds from the school year. So even if you *think* your school won’t pay for your PD, ask anyway! You never know unless you ask. And I’ve found over the years that what seems like a lot of money to a teacher (especially when it’s coming out of pocket) is actually a reasonable request for most schools. You deserve the best teacher growth and professional development plan possible. And what that looks like for you may not be what it looks like for the teacher across the hall. It’s time to take your learning into your own hands and enjoy your PD experience. I hope to see you in one of our opportunities this year!